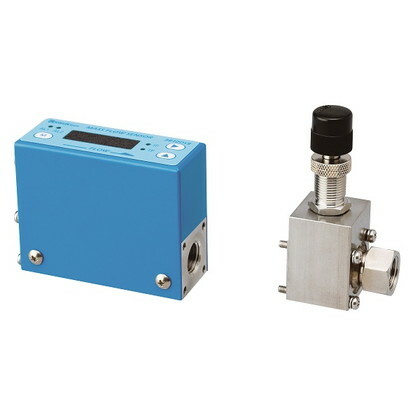 The Model 3810DS II is a mass flow meter with a built-in display using a time-tested flow sensor. The 3810DS II displays total flow in addition to instantaneous flow, which is an improvement on the previous model 3810DS. Just like the 3810DS, the 3810DS II is also available with flow sensor and precision needle valve built into one piece. ・The display is built in and the meter only requires connection to a 24-VDC power supply. ・The meter measures mass flow and directly reads the flow. There is no need for flow correction calculations based on tem-perature and pressure. *A conversion cable for the previous model 3810DS is available. Specifications relating to the flow range (e.g., flow range, accuracy and repeat-ability) are expressed in N2 or air equivalent. The product will be built with the primary pressure of 300 kPa or less and the secondary side open to the atmos-phere. For details on the pressure requirements, ask us.